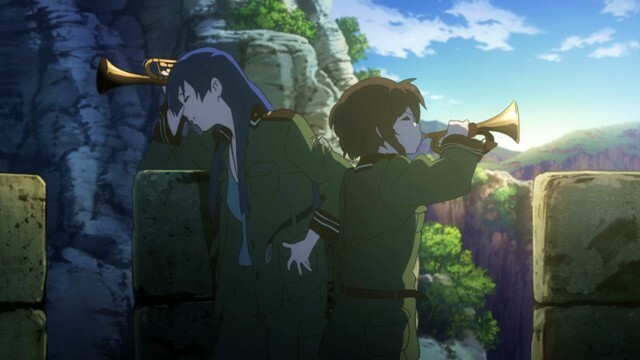 Sound of the Sky (Sora no Woto) is a 12-episode anime series produced in 2011 by A-1 Pictures, written by Hiroyuki Hoshino and directed by Mamoru Kanbe. 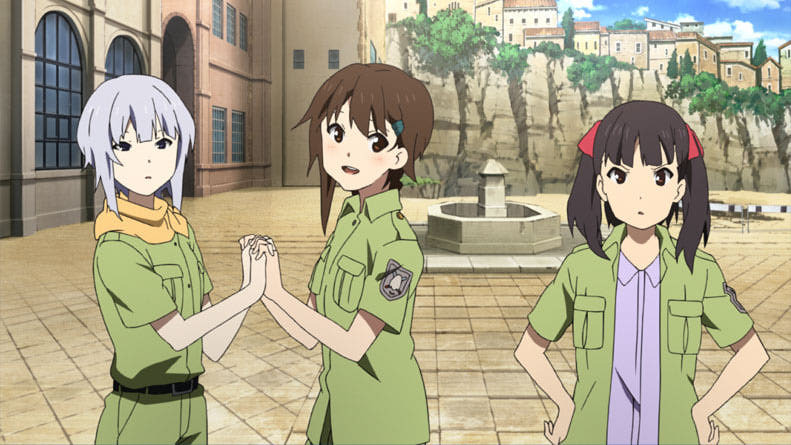 At first glance, the story seems to be nothing more than the daily adventures of five Moe-looking teenage soldiers in a remote military outpost. Underneath the Moe design and the relaxed pacing, however, the show offers a glance into a familiar-yet-uncanny world, a cast of fleshed-out characters, and a story of humankind’s remarkable will to survive and build. The world of Sound of the Sky contains two warring nations in a temporary ceasefire. The story takes place during this uneasy peace, in a town in the middle of nowhere. Stationed in the town’s fortress is a platoon of five teenage soldiers living relatively quiet lives. With each hint dropped, the viewer is drawn into the world’s familiar-yet-uncanny atmosphere. While we learn a lot about the world’s myths and customs, the exact details of its history are left to the viewer’s imagination. However, the setting still maintains its intrigue and remains a strong point of the show. Animated by the studio A-1 Pictures, the visuals are breathtaking. The animation is fluid enough, although there were a few shortcuts with still shots and offscreen talking. The main cast comprises of the platoon members, with helpful locals making up the supporting cast. The platoon is your typical mix of personalities, ranging from strict to lax, and from talkative to reserved. Through their interactions, the viewer gets hints about their backstories and glimpses at the different parts to their personalities. While this approach is nothing new to storytelling, it fits well with the show’s focus on exploring the world and its inhabitants. As for the character design, it is very evidently Moe-inspired, which will generate mixed opinions among viewers. Sorami Kanata: the main protagonist and new recruit. As a child, she was saved from an abandoned warehouse by a soldier playing “Amazing Grace” on the trumpet. This inspired her to join the military because that was the only place to learn musical instruments for free. Episode one establishes her as flighty but well-intentioned, and this personality soon profoundly affects everyone. Kazumiya Rio: the second-in-command, Team Dad, and Kanata’s trumpet teacher. She initially appears to be strict with a no-nonsense style, but can’t help relaxing a bit from Kanata’s earnestness. Throughout the series, constant hints are dropped that her family connections may make her an important player in the war. Filicia Heidemann: the commanding officer and Team Mom. Beneath a bubbly exterior and lax attitude hides a dark traumatic past, culminating with an existentialist quote midway through the show. Revelations of her hidden character mark important turning points in the show’s mood. Kannagi Noel: the tank driver, genius mechanic, and (at first impression) the emotionless Rei Ayanami clone. She, too, soon warms up with Kanata’s encouragement, with her backstory further fleshed out in the final episodes, giving her a reason for the reserved behaviour. Throughout the series, her stoic one-liners are a constant joy to watch. Suminoya Kureha: the gunner and youngest member. She is annoyed at the platoon’s lax attitude, the fact that central headquarters treat the platoon as a joke, and the fact that the new recruit just goes along with it all. Like everyone else, she soon warms up to Kanata. 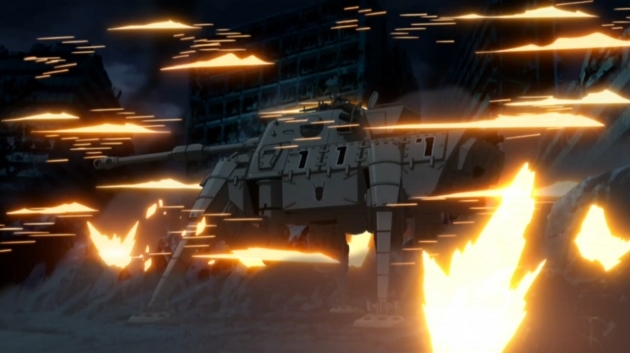 The pacing of this 12-episode series is reminiscent of shows like Haibane Renmei (2002), with a relaxed beginning shifting to a more serious conclusion. In Sound of the Sky, since the platoon is stationed in the middle of nowhere, the members see little action, and their main job becomes building rapport with the locals. Thus, episodes 1-6 are leisurely paced (at slice-of-life levels), using the soldiers’ daily lives to explore the town and flesh out the characters’ backstories. 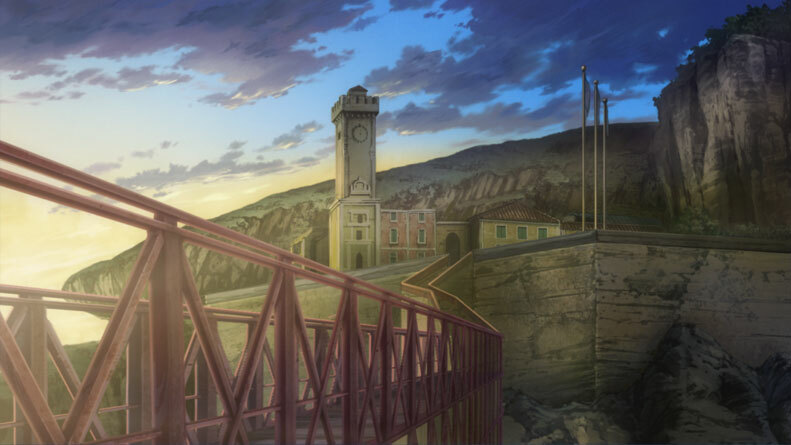 Just before the viewer gets tired of the pacing, however, the series shifts to a more serious tone, first with Filicia’s traumatic past revealed, then with Rio’s family connections, and finally with the looming threat of war all but realized. Granted, some viewers may not enjoy the show’s mood shift. Those looking purely for slice-of-life comedy will not enjoy the drama of later episodes, while those looking for drama may feel that the slow pace of the early episodes make the drama feel rushed (check out, for example, this review). For me, however, this change of tone occurred at the perfect moment to stop me from growing bored of the pacing, and showed me that this series was willing to go beyond cute people doing cute things. It could even be argued that just as in Haibane Renmei, the relaxed beginning allowed the viewers to explore and become emotionally invested in the world and its characters, which is particularly important for the dramatic finish. In short, if you liked Haibane Renmei’s pacing, you’ll likely enjoy that of Sound of the Sky as well. The ending, however, garners conflicting opinions. A quick Google search of other reviews will show that some call it a satisfying close to the series, while others find it too contrived. While it does require some suspension of disbelief, I personally found it satisfying enough given the drama and tension leading up to it. The soundtrack was composed by Michiru Oshima, who also composed the score for the original Fullmetal Alchemist (2003) series. Although there are no standout epic tracks, the music does fit the laid-back atmosphere of the show, at least during the laid-back moments. Of note, however, is the trumpet rendition of “Amazing Grace”. Used at multiple points in the series, it becomes almost like a symbol of hope and salvation. While extremely appropriate for the show’s themes, those who aren’t fans of the piece may find it overplayed. The opening song deserves mention. Written by Yuki Kajiura and performed by Kalafina, with Elfen Lied-inspired visuals, it is quite catchy and worth checking out: http://www.youtube.com/watch?v=TqT7SLkh9G0. This section is for people who judge a show by the ideas that it explores. Beneath the character interactions that form most of the show runs the recurrent theme of the human will to live and build. The world has suffered through an apocalypse, all life is extinct in the sea, and deserts are encroaching habitable space. And yet, human towns are blossoming, trading, and doing all the wonderful mundane human activities. Likewise, communities are decimated by war, children are orphaned, and child soldiers live through near-death experiences. Nevertheless, they continue with their lives, smiling as best as they can. Indeed, the past plays an important role in the show in shaping the present. Practically half the show is the viewer learning about the history of the world, while the other half is learning about the characters’ backstories and showing how their present behaviour is a form of coping with past events. Finally, war, peace, and unity begin to feature heavily near the show’s conclusion. For all its Moe cuteness, this series takes war seriously. Throughout its run, it shows war’s effects on civilians and soldiers alike on both sides of the conflict, with child orphans, traumatized patients, and a captured enemy soldier. The show also suggests that people are united through their appreciation of music (which sort of made me cringe). Sound of the Sky‘s strength lies in the way it sets up its atmosphere: from the breathtaking visuals, to intriguing setting, to the relaxed pacing that allows us to explore the characters’ backstories and understand their motivations. For some, however, the pacing is a weakness: some may regard the relaxed pace too slow, especially at the beginning, while others will complain that the show does not leave enough time for a satisfying ending. Indeed, if you think hard enough, you’ll find a few plot holes in the ending that some find too contrived. The influence of Moe in the show is also evident in the character designs and a few really corny moments; some will enjoy the Moe, while others will not. All in all, though, Sound of the Sky is perfect for those who want to watch a short, relaxing show that draws you into its world and ends with a dramatic finish, or for those who want something more out of their slice-of-life comedies than cute people doing cute things. Sound of the Sky is licensed by Nozomi Entertainment and can be streamed with English subtitles on their site or Youtube Channel. This is a great article! You really captured some very key points about the show and gave it its deserved “credit where credit is due”! I just started watching this, and I’m glad I’m not the only one who likens this show to “Haibane Renmei”, which is one of my all-time favorite Animes—and I never thought I’d find one that is so much like it in so many ways! I have high hopes for this show. (What’s funny is while i was disappointed by there being only one season of Haibane Renmei, I’m not bothered by that prospect with this show at all, because I’m going to treat it like watching a 12-part film (much like watching “Erased” was for me—another great anime). It makes it all worthwhile! Thanks again, you are a fantastic writer—keep up the wonderful well-thought-out work!